At its beginning in 1936, British television was an exclusively live medium. Although it was possible to transmit film, this accounted for filler material only and all original television programmes were broadcast live. The instant relaying of actuality from the studios or via Outside Broadcast units was television's unique characteristic. Drama was part of the television schedules from early on and with scripts, actors, and often producers drawn from theatre it was entirely natural that these early plays should be live too. Even had the idea of pre-recording plays occurred, the fledgling BBC television service lacked resources for the filming and editing that would have been required. 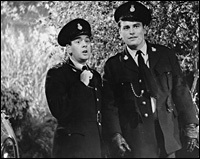 Despite the introduction of new staff and methods, and ITV from 1955, drama remained essentially live for television's first quarter-century. As a new and unique medium, live TV drama developed its own production processes as it went along. Initially, some producers used a one-camera-per-scene approach but this gave a very flat effect, leading to later critics dismissing early television drama somewhat unfairly as 'photographed' theatre. Soon, however, multiple cameras were being used for each scene, with live 'mixing' from one camera's shot to another's, as opposed to post-production editing as in film. It was possible to include sequences of film within a live transmission, usually to establish a location or bridge scenes, but these were always kept brief and the vast bulk of the drama remained live. Inevitably, despite rigorous rehearsal things would sometimes go wrong during a live performance. Actors would forget lines, props were lost, cameras and microphones appeared in-view or broke down. The most famous of all live drama disasters was the death of leading actor Gareth Jones during 'Underground' ( Armchair Theatre , ITV, tx. 30/11/1958). As with theatrical tradition, the show went on, with Jones's dialogue reassigned to other characters and camera moves rearranged on the fly. Yet such unplanned interruptions were minor and many went unnoticed by the home audience, thanks to improvisation and rapid fixes on the studio floor. The live method was not without its merits; indeed, had it not been popular and effective, live drama would not have remained the dominant form of television drama for so long. For the broadcaster, live productions were relatively quick and cheap, minimising studio time and eliminating post-production. On the artistic side, actors enjoyed the continuity of a complete chronological performance, an advantage against the disjointed out-of-sequence method of film. This was often discernable in the broadcasts, with the quality and power of many performances shining through. Some producers and directors, for all that they craved the convenience and control of pre-recording, found the exhilaration of a live broadcast an essential ingredient for a vibrant production. Producer David Rose felt that this excitement was integral to the success of Z Cars (BBC, 1962-78), which he insisted remained live for many years after it was necessary. Actor Brian Blessed later recalled that a trial of a pre-recorded episode had proved quite a disappointment. Live drama's production methods leant it its own aesthetic. The use of multi-camera shooting meant that sets could have no more than three walls, often fewer, to enable camera movements, and as such long shots were rarely possible, with the bulk of most productions being seen in mid-shot and close-up. While this could leave some productions looking dull and uninvolving, a good producer could turn these limitations to their advantage, with closely studied performances and an intimacy in storytelling. Others, such as Rudolph Cartier , made their names with drama which attempted a new aesthetic, defying these limitations with large-scale and fast-paced dramas with the ambition if not the polish of feature films. ABC 's Armchair Theatre (1956-74) was famous for developing a house-style which put frenetic, almost constant camera movement on screen in the early-1960s. The complex nature of live productions, with cameras moving rapidly for each new shot, dodging sets, actors and other cameras' cables, meant that the mise-en-scène was often imperfect as a shot began, with small adjustments in composition or focus occurring 'on air'. Although rued by some, this 'rough around the edges' imperfection was seen by others as a welcome characteristic of the medium, lending it a sense of spontaneity. Recalling his time as a drama producer in the early-1960s, Leonard White noted that modern pre-recording may add "a superficial polish, but more often than not lacks the fire of the need to publish and to publish quickly - the 'live' quality which is the unique essence of television". David Rose commented in 1966 that "The perfect recorded piece, the perfect film programme, with all the added polish that a re-take may give it, always takes just the edge off reality." It was this quality of 'reality' that was live drama's defining characteristic. The suggestion that live drama had a sense of reality may seem to contradict the artificiality of the studio-bound production method, but the 'reality' alluded to is the immediacy of a drama that is conspicuously live, appearing in the nation's living rooms the same second it is acted in the studio, warts and all. As White recognised, television is a live medium by the very nature of broadcasting, and achieving the sense of immediacy, along with television's customary direct address, is key to exploiting this. Its immediacy and 'one-off' status lent live drama productions the same sense of occasion as a unique outside broadcast - a major sporting event or state occasion - and as such engendered a feeling of community among viewers who watched as one audience. Indeed, critic Philip Purser suggested that by the mid-1950s live drama had even supplanted the outside broadcast as "the most vital and spontaneous... manifestation of television". Drama remained almost exclusively live until the 1960s, when the new medium of videotape was adopted for general use. However, this early video technology was both expensive and inflexible, hampering its early take-up. Video could not easily be edited until towards the end of the 1960s and so programmes were often recorded as if they were live, maintaining the spirit of a live broadcast. Even so, properly live drama did not die out. As pre-recording was becoming standard, the BBC 's Thirty-Minute Theatre (1965-73) began with a remit of reintroducing live plays. The following year saw the launch of Z Cars spin-off Softly, Softly (BBC, 1966-76) as a live series due to the perceived benefits of the medium. The Eleventh Hour (BBC, 1975) was a series of plays which took advantage of the live method to maximise their topicality, being written only in the week of transmission. Southern Television produced the lunchtime soap-opera Together live in 1981 and in 1983 Robin Midgley attempted to reinvigorate the format from the BBC's Birmingham studios, with Live from Pebble Mill , with mixed results. More recently there have been live episodes of The Bill (ITV, 1984-) and Coronation Street (ITV, 1960-) to celebrate milestones. Minority channels have also made live experiments, with Channel 4 's 'Play in a Week' (Alt-TV, tx. 25/8/2000) and BBC4 's The Quatermass Experiment (tx. 2/4/2005). In the digital television age, where content on-demand, +1 channels and narrowcasting are buzzwords, it remains to be seen whether the immediacy of live drama can prove a draw for an audience. Ironically, it is now considered an expensive way to produce drama. If it is to have a future, it may be in the pattern of BBC3 's city-spanning musical Liverpool Nativity (tx. 16/12/2007), an outside broadcast as unlike traditional studio-based drama as could be. It created a community spirit, albeit a localised one, in a more literal way than previous live drama by drawing on the talent of Liverpool and merging a piece of large-scale public theatre with a live television broadcast.